Browse or search for the Horse Races Now app. 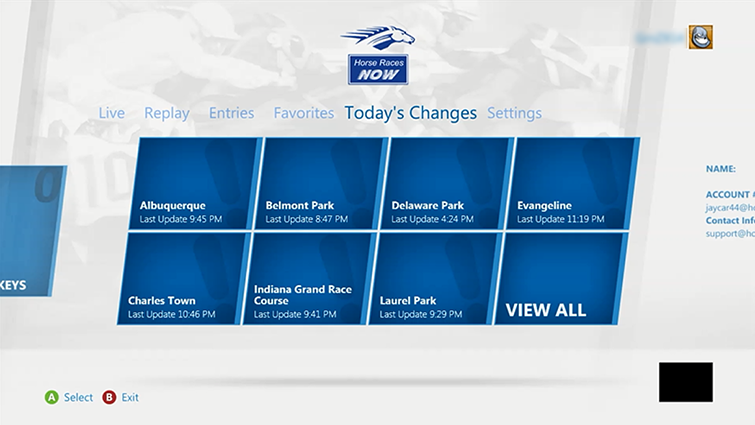 Select Horse Races Now, and then select Download. To start the Horse Races Now app later, go to apps, My Apps, and then Horse Races Now. Start the Horse Races Now app. Note The first time you start the Horse Races Now app, you’ll be prompted to sign in or create an account. 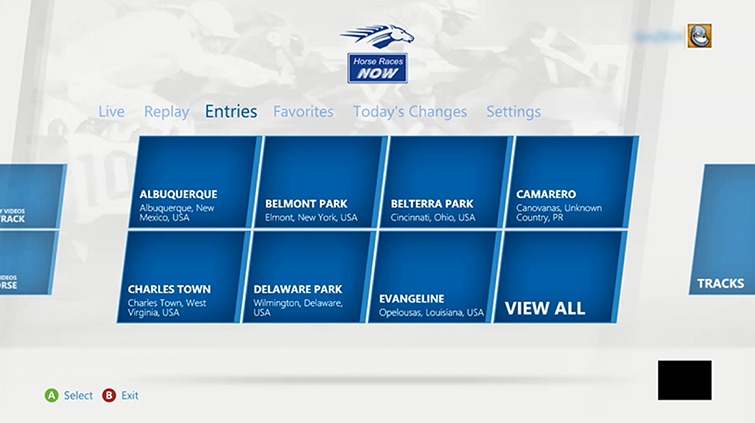 From the Live hub, you can select from the available racetracks and watch live racing. To the right of Live is the Replay hub, where you can watch previous races. 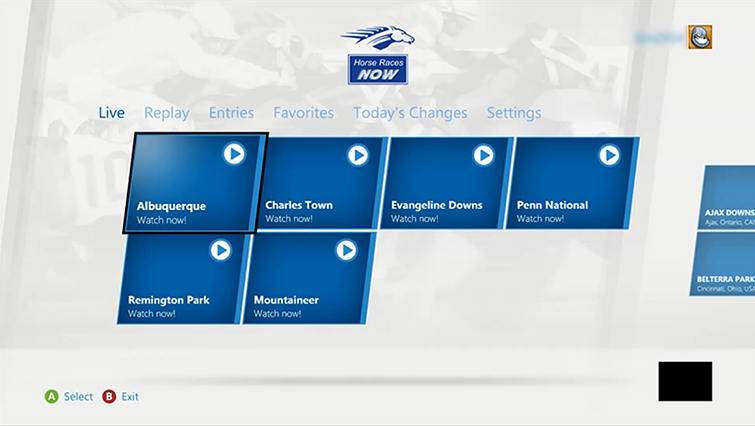 You can choose to watch previous races by either racetrack or horse. To the right of Replay is the Entries hub, where you can view the entries for upcoming races by racetrack and date. To the right of Entries is the Favorites hub, where you can add favorite racetracks, horses, trainers, and jockeys, and then view workouts and previous races. To the right of Favorites is Today’s Changes, where you can view changes such as race scratches, weather conditions, and track conditions. 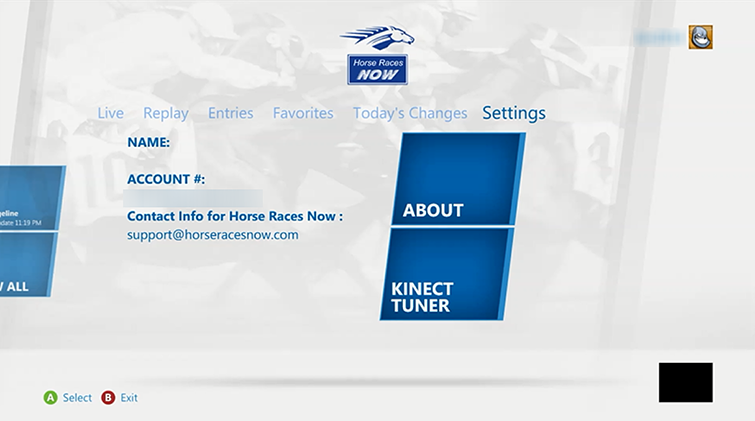 To the right of Today’s Changes is Settings, where you can learn about the Horse Races Now app and manage Kinect settings. Once you’ve located something you want to watch, highlight it, and then press the A button. 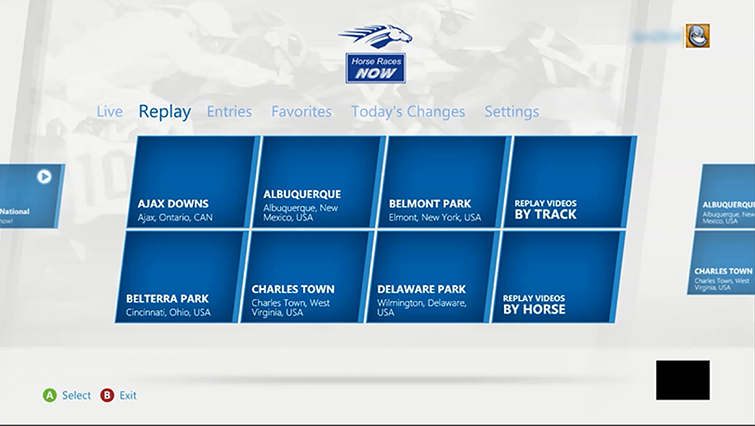 If you use Family Settings to control what content can be watched through Xbox Live on your console, the Horse Races Now app will follow those settings. For example, if you use parental controls to restrict access to some kinds of videos, those programs will be marked with a “restricted” icon in the Horse Races Now app. To play a restricted item, an adult must enter the Family Settings pass code. ¿Quieres contactar con el Soporte técnico con referencia al problema "Set up and use the Horse Races Now app" acerca del que estabas leyendo o con referencia a otro problema?